It's a late blogging evening, and I hesitate to even get this started. It makes me sad to remember it. I love how they say Welcome Home when we would enter the Grand Flo, it is like our home, like one I've always dreamed of... but we must live in reality for a while in order to make our dreams come true. And our Disney Dream was coming to an end. Wednesday was our last day. As Daddy was packing us up in the morning, the boys and I got out of his hair, by going to the pool. I had wanted the boys to play one more time at the Mad Hatter Sprinkler pool before we hit the road. I loved the location of this. But it was not Sam's favorite. Sam doesn't like getting his head wet, so he's hiding behind the sprinklers on the other side, out of wetness range. It was 10 am, so not too hot, but very sunny. We picked a gorgeous time to swim. I mean, come on, check out this view. This is the lagoon, looking out on this view, all is right with the world. I found out, as we're leaving today, that they show movies right next to this beach at night. Man, how'd I miss that! From one pool, to the other. The boys love the 'quiet pool' better than the noisy deep one by the sprinkler. So, once last visit to their favorite pool before we head out. Honestly, it's my favorite too. We swam for about a half an hour before heading back upstairs to put the finishing touches on packing. And we realized, that instead of going straight into the park, we needed to eat. We just happened to still have a set of Table Service meals left. So we took care of that at the Grand Floridian Cafe. We visited this restaurant like 3 or 4 times on our honeymoon. We went there for dinner the night we'd arrived on our honeymoon, and the waitress had made a big show about me signing my new name for the first time. .. and I screwed it up, and she had to bring me a new check to sign. It was much easier this time, with just bracelets to scan. And the food was so good. I don't know why we didn't go here more often! For dessert, they offered a number of items or a sampler for two. Get this, the sampler could be used by Dining Plan. So we were all over that. So much yumminess, so little time! After lunch, we headed out to the park again. The boys were bummed we lost out on Winnie the Pooh, and the Mine Train, as well as they were requesting one last trip to Buzz Lightyear's Space Ranger Spin. Mommy had hoped to bump into our friends Dan and Nancy and their kids, but somehow while we were on Main St.(probably getting these pics taken) they walked right past us and didn't come back. So we all move on. I'm glad we kept this last day in our pockets. The difference between a 5 day pass and a 6 day pass is like 10$. And it was worth it to have a 'quick pop in' to do things that we'd missed out on. I'm also very Thankful for the DAS Pass. In cases like ours, that kind of flexibility was a great gift. 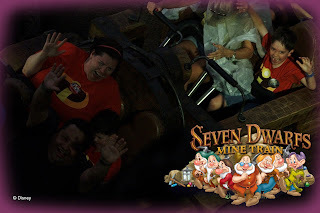 We checked in at Buzz Lightyear, then popped over to Seven Dwarves Mine Train. Luckily, the line was moving pretty quickly. It looked like it might rain soon. We hoped the ride wouldn't get shut down again before we got to ride. The boys loved seeing the dwarves house while we were in line. This was our photo from the shot. It had started raining during the ride. This picture was when it was just starting to rain. Pretty sure, we were the last ones to go before it got shut down for a while. And we got stuck in it. Apparently, the train before us had a disabled person who took a significant amount of time and work to offload, so they stopped our train. Outside. In the rain. In the Pouring Down Rain! Locked in a tiny car. Puddling. Puddling in my shoes, in my hair, in my lap. Words cannot describe the discomfort involved in buckets of rain coming down when you are trapped, seated, in a rain car. With my autistic son locked in the car behind me. It was not good! Chris loves roller coasters now, so he volunteered to ride by himself. He got place with an older lady, who happened to already have her poncho on. When the train stopped, and he started to lose it, she tried to cover him with part of her poncho. Initially, he fought her. I couldn't reach him, I just yelled, It's OK, it's only Rain. I tried to talk him down from where I was. I tried to wave my hand so he could see me. I don't think it helped. Sam shrank, "I don't like rain. And I don't like roller coaster." He shut down. Yeah, pretty sure Sam was scarred for life by the experience. Chris did calm down eventually. It was probably only 5 minutes, but it felt like 30. It's gonna be a long time before Sam gets on a roller coaster. Finally we moved, got off. Chris said that he liked the coaster, but he didn't want to do it again. The damage had been done, we three were soaked. There was puddling in our shoes. We'd had nothing to save us. And where were all our clothes? That's right, in the car. That didn't really make it better. We got off the ride, but my pockets were soaked, and I thought it better to leave my phone where it was until I found shelter. I glanced across the 'street' from the Mine Train exit, and saw the Pooh gift shop, as we were running toward it in the buckets of rain, I saw Eric wave at us from straight ahead. But everyone was waiting in there. I stood there a second and saw the entry line for Winnie the Pooh right next to us. 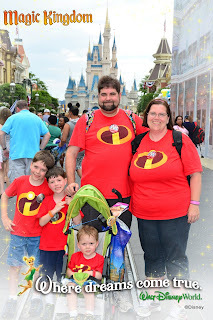 I thought, we should go there, and ask if we can get the boys on it, since we lost our Fastpasses due to the "honey spill" the night before. It was at least ride one of the rides we wanted to do, instead of just dripping there in the doorway to the gift shop. What's a little more water to get there? So I ran to ask. They said yes. So I returned, grabbed kids and ran. Eric pointed out later, that it had not been worth it to him to move, he rather wished I'd taken some time to discuss it, rather than just run. He and Jake weren't wet, our stuff had not been wet. I didn't think, I just ran. And we all got wet, and our stuff got wet. And the ride shut down after we got in the line. What's a little more rain? We didn't have all night, we wanted to get moving. So I moved. But then once we all got in the Pooh line, the line shut down because no one was leaving the exit through the gift shop. As long as no one could exit the ride, the ride could not go. So we stood in line, dripping, waiting for the rain to lighten up, for the crowds to move. We were soaked, and Eric was not happy with me. It ended up not being a good choice. The big boys didn't care, they weren't too mad at me. 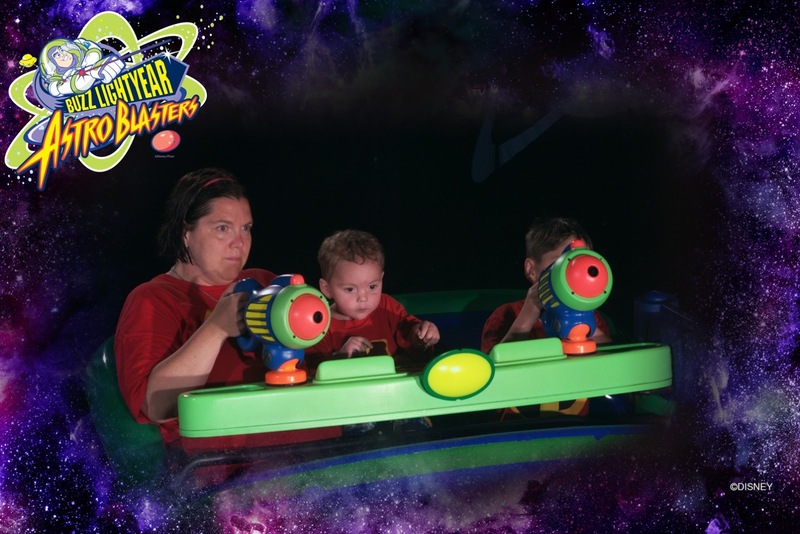 They were a little mad that the ride wasn't working. I was mad at the rain, and the world, and myself for choosing unwisely. And I hate having soggy wet feet! I took my shoes and socks off and stood there barefoot. I hate floors when crowds of people have been standing, dropping god knows what kind of goo, but I learned that more than that, I hate swamp feet. Next time I go to WDW, remind me to pack shoes that drain water, I've heard Keen's are nice. My poor boys. Sam was shivering and Chris had found his box camera while we were packing earlier in the day, so he'd brought it to the park, and wanted to take his own pictures. He liked to take pictures of me taking pictures of him. We'll see how it turns out. It was wet, it was dark. Did I mention how much I don't like having wet feet? I'm getting fuddy duddy in my old age. Guess where the ponchos were? Packed. We had 2 and Jake's shower curtain packed. The kids may have been a little mad at me for that. Ironically, the one who dried off fastest was Jacob. He's pooped in his pants at the hotel after lunch, and we had packed all backup clothing in the car. I decided it was easier to buy new shorts than to go to the car. I thought they gave emergency discounts. Apparently, not at the Grand Flo. But he got himself a very cute new pair of plaid swimshorts. You know what happens to swim shorts when they get wet? They dry. Fairly quickly. Not so with jean shorts which is what I was wearing. Finally, probably 20 minutes, the rain lightened up a bit, and Pooh started moving. So we were able to get on. 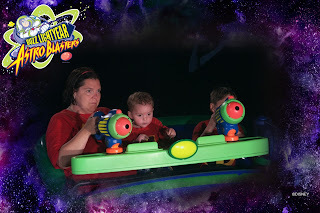 Jacob actually didn't mind this ride. The wind and storm part of the ride was a little uncool. We were already cold and wet, we didn't need to fake it too. I still like the ride. Though I think Peter Pan is better. Jake enjoyed it. It wasn't scary to him. 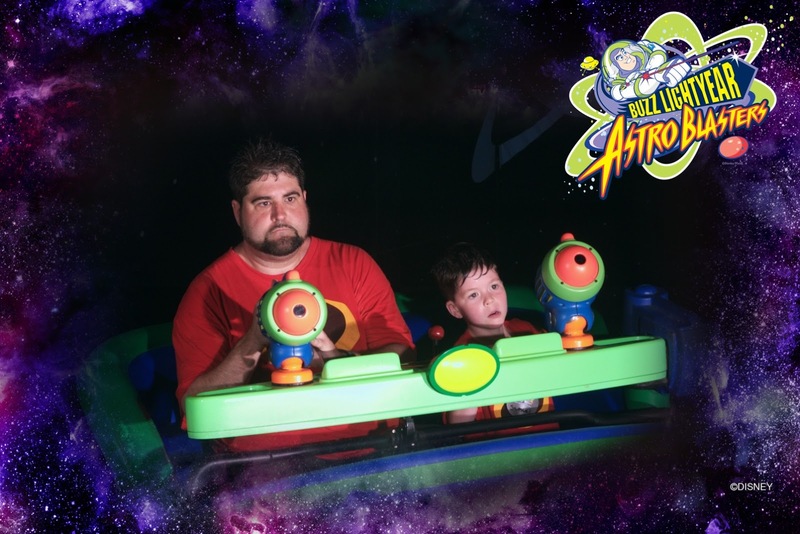 I think he'd gotten over his fear of dark rides. I feel bad for whoever rode after us. We left puddles in the seats. But our adventures had long killed the hour we needed to wait for our DAS time for Buzz. The evening redeemed with one last 'pew pew' game! Pretty sure we left puddles in the seats there too. On our way out of the park, we thought we'd get attacked by the same parade we've seen. But this time it was something new, a special Rainy Day parade, it's abbreviated, shorter than the rest, and the characters are covered, but I was impressed they just didn't cancel it outright. Made the leaving not so bad at all. 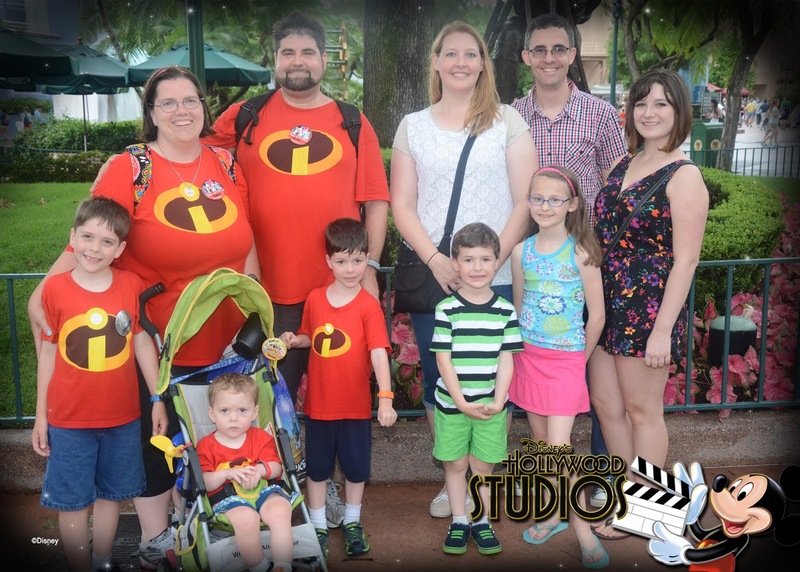 In other awesome news, we had other friends that had arrived in WDW just the day before. 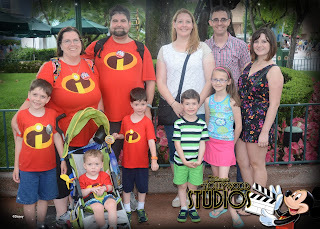 Our friends the Gornto's had reservations at Hollywood Studios while we were adventuring in the rain. So after Buzz, we left Magic Kingdom and hopped the bus there. I was too wet, and frustrated to be sad to leave Magic Kingdom. We had a little hiccup at the entrance. We thought we'd had Park Hopper. We hadn't used it though, and the one time we try, the very last day, we find out, that in fact, we didn't. Blessedly, Customer Service let us in. Only because it was after 4 pm by that time, and the park was only going to be open 5 more hours and it was our very last day. And frankly, our friends were in there! But they would've come out, I'm sure. We stood there chatting for about an hour. And that was cool. 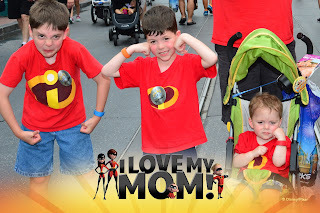 Then we went over to see Baymax, and hopefully see the last Disney Jr. show. We DAS'd the last Disney Jr. show of the day having about half an hour to kill. And in the mean time we popped next door to the Animation studio, and meet the characters. 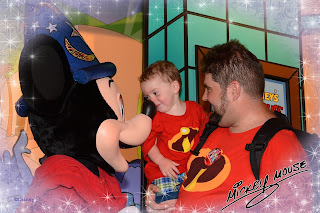 Jacob was less than inclined to meet Mickey. 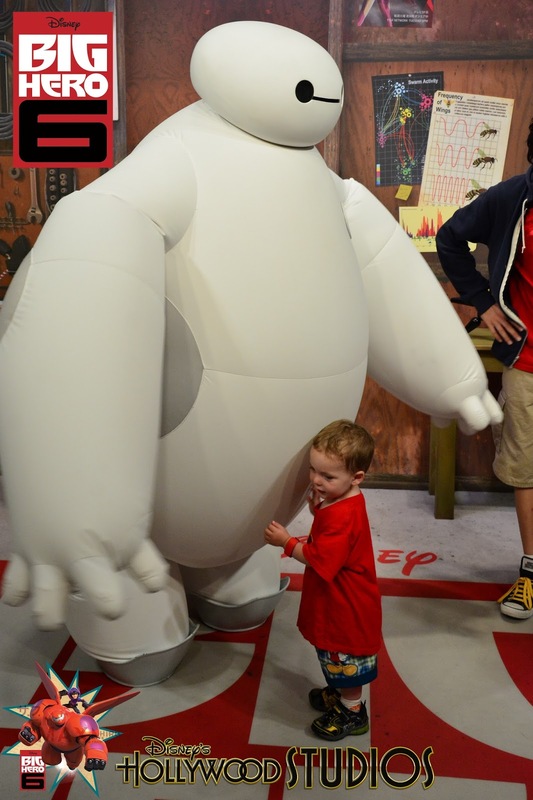 He had wanted to meet Baymax, but the line was so long for him, we were going to have to come back. 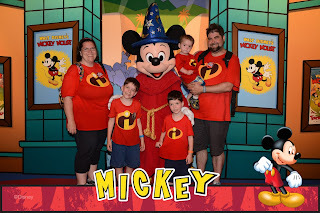 The line for Mickey was significantly shorter, we had time to do that. But Mickey wasn't the one Jacob wanted. He had a flop down tantrum. It may Also have been because he hadn't had a proper nap that day. But Mickey worked his Magic. He got him to get up, he wasn't quite smiling yet, but once we got close, he started bonking noses, and giving 5/4s with fireworks, and Jake liked that. Yeah, Mickey worked his Magic on him. 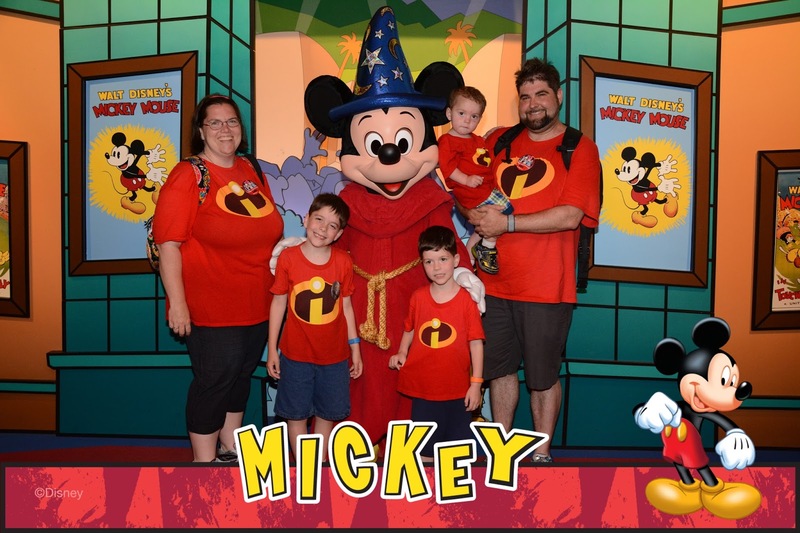 So this was our last Mickey meet. The line for Baymax had been an hour long. And I explained that a. we had DAS pass, and that we FPs for Disney Jr. She said, come back immediately thereafter and they would get us in. So we did. So we went next door and the boys sat on the floor for the Disney Jr. show. Now, I'm sure the 9 year old would tell you, he didn't NEED to go see the Disney Jr. show, that they were too big for that. But that he'd put up with it, because you know, for the kid. The baby would need it. Sure. But surprisingly, they all enjoyed it. Actually Chris had more fun than any of the kids, he was picking up all the treasure papers, and popping bubbles all over. I had to even pull him over a bit and say, hey, it's for the little kids, let them have some fun too. Still, everyone had a great time doing that, and I'm glad I made the point in getting back into that one. Jake was mesmorized, completely amazed. He loved the "Meow" puppets. He has fallen for Mickey. But Mitmat was his favorite. When we returned, they had shut the line down. The gals told us we could get in, to just wait by the end, we'd be second to last family. There was another last family of the day (I think they Knew Hiro) but we waited out the line. Probably a half hour, the kids just played with the animation stuff, while I hung out at the end of the line. Finally, the gal gave me a look, I whistled for the boys, and blammo we got to meet Baymax. Jacob calls him Mitmat, and he ran right up to him to give him a hug. He feels like a latex balloon. He has no elbows or wrists, so his hugs are kind of funny. But Jacob didn't care. 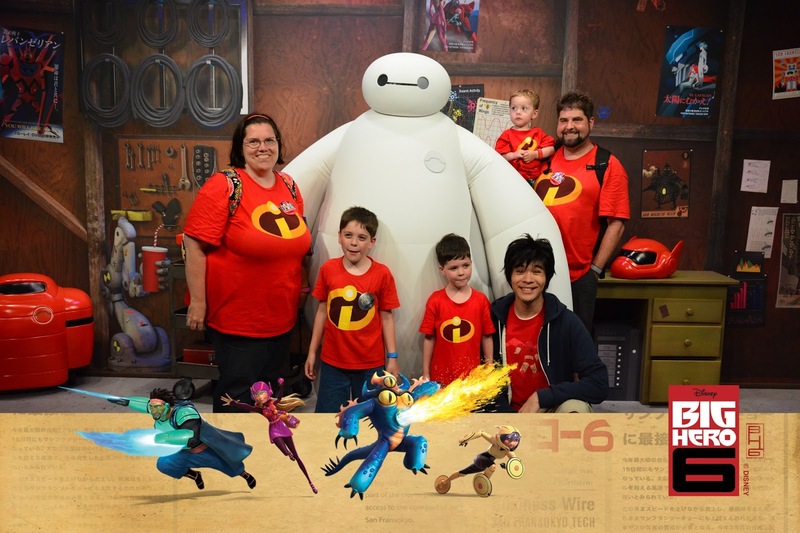 All of us had fun meeting Hiro and Baymax. Christopher told us all he wants to go to Nerd School. Yeah Baby! It was a Perfect note to end on. So we didn't tempt fate by trying to do anymore, we started to leave. OK, we were hungry, so before we really left Hollywood studios, we cashed in a few more snacks. Mickey the soft pretzel, with the tub of processed cheese product. Oh yeah. Eric got nachos, and it was a bag of tostitos, a tub of processed cheese product heated, and a container. They didn't even open them. Well, Eric said they tasted fresh that way, which was good. Then it was time to take the bus back to the Grand Flo for the last time. But I was too tired to get sad. I had to pee and change Jake while E ran for the car. Jake's poor bottom had gotten raw from burny poos in the last few days. And being wet, with a raw bottom, every time he tooted I took him to change, I didn't want him to be uncomfortable. So I went in with him alone. The music was playing, the lights were dimmed. This was what brought tears to my eyes. The orchestra was playing Nat King Cole's, Smile. And amazingly, it was perfectly appropriate for the last thing, my last thought, as we left our Disney 'Home'. "Smile, though your heart is aching. Smile, even though it's breaking. .... You'll find it's all worthwhile, if you Just Smile." So I did. I smiled through my tears as we said goodbye to the Grand Floridian, and commenced driving to the beach. We'd hoped to have an evening with Amy. But we opted to just find our hotel in Daytona and go to bed. We crashed at the Rodeway Inn on the beach in Daytona. We couldn't see much when we arrived, it was 10, dark, and the lights were all off. We were just grateful for clean, dry pajamas and beds!